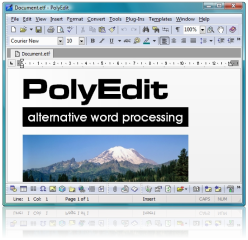 PolyEdit is a powerful, multipurpose, yet easy-to-use word processor and text editor for Windows that is designed to satisfy the most demanding word processing requirements. It offers a wide variety of features, tools and add-ons that the feature list shows only a part of what this award-winning word processor can do for you. You can also use PolyEdit as an HTML editor, source code editor, personal information manager... and even as a secure password keeper! It really is a "Swiss Army Knife" for text. No longer do you need to jump between programs (with the problem of trying to remember how to use each one). You can do it all in PolyEdit! Support for numerous document formats and encodings: RTF, MS Word 95-2007, Corel WordPerfect, Unicode (UTF-8 and UTF-16), MS-DOS, Unix, etc. Useful tools for information management: Catalog, Snippets, etc. 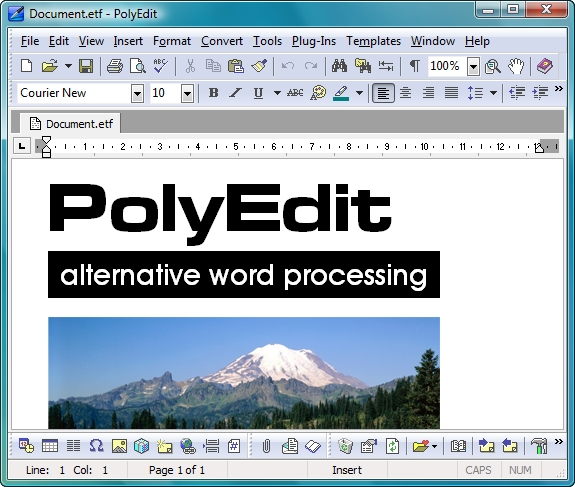 You can download and try the word processor before you buy it. Download a FREE trial of PolyEdit now!